Aside from the regular reporting of results from randomized controlled clinical trials, an increasing interest in results of already approved therapies in real life (the so-called “Real World Evidence” or RWE) is being observed. A press release on September 8 by Roche stated that the results of one of the two pivotal phase III randomized controlled trials (RCT) with lampalizumab every 4 or 6 weeks in GA, the SPECTRI trial, had not met the primary endpoint (slower progression in treated as compared to untreated eyes) at year 1. The results from the second pivotal RCT, CHROMA (in which the Institut de la Màcula is participating) are still pending and will be communicated briefly. In a retrospective natural history study, data collected from electronic medical records in UK in patients with GA showed a greater impact of disease on quality of life than previously expected, with more than half of the patients avoiding driving in the study period due to visual impairment. It was stated that better anti-VEGF treatments, more effective or long-lasting, and new treatments targeting new pathways to allow combination therapy with conventional anti-VEGF were needed. RTH-258 (brolucizumab) in the HARRIER trial is an anti-VEGF treatment intended to increase the time between intravitreal injections, whereas abicipar is a DARPin that will be evaluated for nAMD in the phase III CEDAR and SEQUOIA trials. OPT302, on the other hand, will be coupled with ranibizumab in nAMD to provide a complete blockade of molecules in the VEGF family. Squalamine lactate is formulated as an eye drop for the treatment of nAMD. Studies with this drug are ongoing. The Institut de la Màcula and the BMF took part in the ePósters section of EURETINA through four presentations in audiovisual formal. The images show slides from Drusen ooze: A novel hypothesis in geographic atrophy (left) and Geographic atrophy phenotypes using cluster analysis (right), which form part of the European EYE-RISK project. The CLEOPATRA trial evaluates if a light mask worn for sleep hours in the study eye can improve non-central DME. The rationale is based on the principle of preventing dark adaptation by suppressing rods. Results will be released shortly. In the UK Diabetic Retinopathy Electronic Medical Record study (a RWE study), Lee et al found that baseline features and stage of diabetic retinopathy are prognostic for proliferative diabetic retinopathy (PDR); intraretinal microvascular abnormalities increased the risk of progression towards PDR, while dot and blot hemorrhages in 4 quadrants increased the risk towards vitreous hemorrhages. The CHARTRES study seeks to characterize eyes with DME that show different response to ranibizumab. The study is completed and results are awaited with interest. Based on several case series, micropulse laser (MPL, in which a series of repeated short pulsed laser impact are applied in a high-density manner in the diseased area) appears to be a viable option to conventional laser photocoagulation (and, in certain instances, to anti-VEGF therapy) in DME. It increases the expression of beneficial molecules, such as heat shock proteins, by the RPE. It is effective, safe, cheaper, treatment can be applied repeatedly and results are long-lasting, despite the fact that the effect may take longer to appear as compared to intravitreal injections. 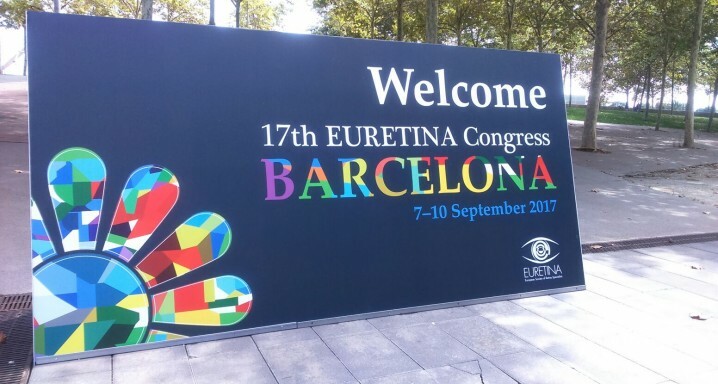 The CLARITY phase IIb trial found that 3+PRN intravitreal injections with aflibercept (Eylea®) were non-inferior (and, in fact, were superior) to panretinal photocoagulation (PRP) for the treatment of proliferative diabetic retinopathy (PDR) without diabetic macular oedema at baseline after 1 year. This increases the armamentarium against one of the most common severe complications of diabetic retinopathy, PDR. A similar study using ranibizumab (Lucentis®) is ongoing (PRIDE), targeting the change in area of neovascularization on fluorescein angiography at month 12 as compared to baseline. The results from the multicenter European PLACE trial, in which half-dose photodynamic therapy (PDT) was compared to micropulse laser (MPL) in near 160 patients with chronic CSC (the first trial of this characteristics) showed better results with PDT in terms of fluid reabsorption (main outcome). The secondary (functional) outcomes also favoured PDT over MPL in most cases, although not all reached statistical significance. Therefore, the results of this study suggest that PDT is superior to MPL in the treatment of cCSC. The RWE study OCEAN to understand treatment with intravitreal ranibizumab injections in RVO in the real world leads to initially disappointing results, with around two/thirds of patients lost to follow-up at the 24-month visit, which compromises overall study results. This suggests that long-term adherence to this treatment with ranibizumab is compromised in RVO. Dr. Marc Biarnés, Institut de la Màcula's Clinical Trials Coordinator and Clinical Epidemiology.